They say beauty is in the eye of the beholder and the new flagship 4K TV from Samsung is giving the beholder beautiful quality and definition. 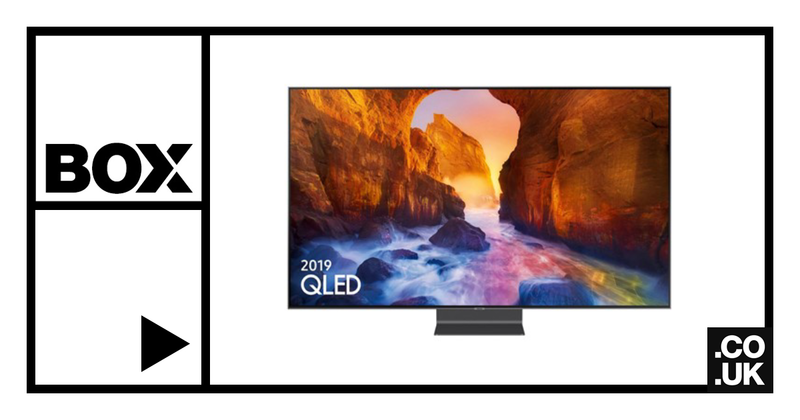 Launched today, the new range of QLED TVs is available in sizes from 55" to a mighty 82" and has been described as a very bright version of the popular LG OLED. There's been an ongoing debate between Samsung and LG as to whether QLED or OLED provide a better picture, but the new Q90 range could have just edged Samsung one step ahead in the battle. The Q90 delivers a sharp and detailed picture which directly competes with OLED through natural colours, bright highlights, deep blacks and well-defined shadows. In short, it makes TV viewing an extremely pleasurable experience. Samsung has stuck to its guns with LCD technology but somehow managed to make the image quality more vibrant than ever. The combination of a direct LED backlight, very effective local dimming and new Ultra Black Elite filter provides exceptional contrast, whether watching in SDR, HD or 4K. What is particularly impressive too is the viewing angle - considering it's an LCD screen, you get a good view from wherever you choose to watch from. The most exciting part of the new range is the brightness capability. It makes for an extremely immersive experience which feels as though the colours are popping out of the screen. The Q90 looks stylish when it's on too, the design is sleek, and it has a minimalistic stand. If, however, you decide to put it on the wall, you can use ambient mode to let the TV blend into the wall by replicating your wallpaper or favourite art piece. Ambient mode is complimented by many other smart features allowing you to watch all your favourite video streaming services directly on the TV and ditching the controller for an app on your IOS or android smart phone. The app allows you to control devices across your home including the Samsung Q90 range from the comfort of your sofa. You can even interact and control your TV using just your voice now thanks to the Samsung intelligent assistant, Bixby (long lost cousin of Siri and Alexa). Universal Guide is another exciting addition to the Q90 which provides you with bespoke recommendations on programs you'd like to watch so you don't have to spend hours searching for your favourite shows and not watching them. The game enhancer enables the TV's picture and sound to adapt as fast as you can game. That means lower lag rates and a crystal clear picture thanks to the AI 4K Processor, so you can indulge in your favourite game without having to worry about tweaking settings. What about the sound? The TV comprises of four speakers, two subwoofers and 60W of amplification which delivers excellent audio quality and performance from clear dialogue when you're watching Corrie to deep bass when you're enjoying Inception. Samsung has really made some noise with the Q90 range (excuse the pun) and we think it's brilliant. See for yourself! Visit our showroom and view the full range of the Samsung Q90 flagship 4K TVs here.